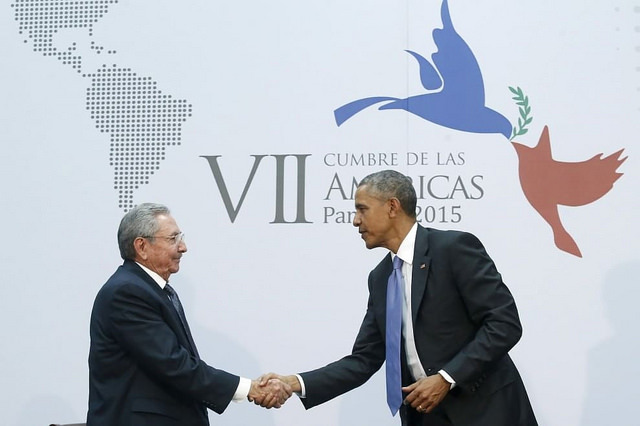 The US and Cuba have finally resumed diplomatic relations. But what will the restored ties mean for immigration policy? Earlier this month, President Obama met with Cuban President Raul Castro at the Summit of the Americas, the first time in more than five decades that leaders of the two countries have formally conferred. It was the most visible manifestation of the resumption of diplomatic relations between the US and Cuba, which Washington and Havana announced in December. The rapprochement has also refocused attention on the fifty-year-old American policy that allows Cubans to emigrate to the United States in unlimited numbers, a “privilege” not conferred upon citizens of any other country. Even before the historic agreement, the number of Cubans coming to the US had significantly increased. In fact, the single largest wave of immigration since the 1959 Cuban Revolution took place not in the sixties and seventies but during the twenty-year period from 1994 to 2013 when the worsening economic hardship in the island led to massive emigration, with a total of 563,740 Cubans being legally admitted into the United States. But immigration from the island might increase even more as a result of the resumption of relations, along with the more liberal emigration policies enacted by the Cuban government in 2012. This raises the issue of the fate of US immigration policy toward Cuba, which was established under conditions vastly different from those existing today. One of the many measures adopted by the US government in the early 1960s to overthrow the revolutionary government in Cuba was to open its doors to all Cubans who wanted to immigrate to the United States. Besides its propagandistic purposes, the policy succeeded in damaging the Cuban economy (although it failed to anticipate that massive emigration would help consolidate the Cuban government by creating a major safety valve for popular discontent long after the more affluent Cubans had left the island). By 1966, six years after the large-scale emigration from Cuba had begun, some 300,000 people (out of a population of approximately 6 million Cubans in 1960) had been admitted into the United States, albeit with a temporary “refugee” visa that did not place them on a path to citizenship. When it became obvious that the Cuban government was not about to be overthrown, the status of these Cubans had to be modified. This was the context in which the Cuban Adjustment Act (CAA) was approved by Congress and signed into law by President Lyndon Johnson on November 2, 1966. Under this law, Cuban immigrants and their accompanying spouses and children who are already in the United States can apply and obtain “parole” status, which after one year makes them eligible for permanent residency. After five years, these Cubans can obtain US citizenship just like any other permanent resident. Thus, legal flexibility was built into the act to allow for the restriction if not the total elimination of its principal features. Any such action by an attorney general can involve significant political costs for her administration. That is why any president may choose to share the political burden of changing the CAA with the legislative branch by including it in a comprehensive package of immigration reforms, an ideal vehicle to smuggle in a modification or abrogation of the CAA. But since the probability of even a modest reform being approved in the near future is very slim given the Republican control of Congress, the chances for legislation addressing only the Cuban case have grown significantly. The severe economic crisis in Cuba, triggered by the fall of the Soviet bloc and which reached a high point from 1992 to 1994, caused serious malnutrition that produced some 50,000 cases of an epidemic of neuropathy particularly affecting peoples’s vision. Street disturbances took place in Havana’s seashore in August 1994, after which Fidel Castro allowed free exit from Cuba for who those who wanted to leave. Thousands did so, often in unsafe homemade rafts (balsas), leading the US Coast Guard to detain 30,879 Cubans in the Strait of Florida between August and September 13, 1994. This “rafter” crisis was the principal cause of the Cuban-US migratory accords in September of 1994 and May of 1995. These accords, periodically renewed in the years since, left the US open-door policy untouched, but the US agreed to accept 20,000 Cuban immigrants per year, to be processed by the US Interest Sections in Havana. And, in what became the “dry feet–wet feet policy,” Cubans detained by the Coast Guard in the Strait of Florida were to be returned to the island — as has happened in thousands of cases — while those Cubans who managed to touch land in the US were entitled to the benefits of the CAA. This agreement provided a safe channel and somewhat alleviated the desire of Cubans to emigrate to the US. But it didn’t fully satisfy that desire, as demonstrated by the increasing number of Cubans, well beyond the 20,000 agreed upon, applying to come to the US. Initially, in order to apportion its permits, the US had instituted a lottery, later abolished by the Cuban government, known on the island as “el bombo.” In the first lottery held in November of 1994, there were 189,000 applicants; by the second one held in 1996, the number had sharply increased to 435,000, and was topped in the third lottery, held in the summer of 1998, with 541,000 applicants. As a result of the 1994–95 agreements, over 600,000 Cubans have legally entered the US. These immigrants — in addition to the earlier entrants, such as the 125,000 who came from the port of Mariel in the spring of 1980 — have tended to come from more modest class backgrounds than those who preceded them. And it is those post-1980 immigrants who have become a clear majority of the Cuban-American population in the US, as the generally better-off Cubans who arrived earlier, particularly in the sixties, have been gradually dying off, and their children have not matched the number of more recent immigrants. Cuban-American sociologist Alex Portes describes the Cuban-American community as a “bifurcated enclave.” On one side are the Cubans who came in the sixties and seventies and their well-off children, who conservative social scientists in particular point to as the “model minority” for Latin American immigrants to emulate. On the other side are the Cubans who came since the eighties — who have not done as well and in fact have a socioeconomic profile similar to other Latin American immigrant groups. In contrast with the older exiles and their descendants, many of the recent ones regularly visit the island — over 300,000 a year — and, regardless of their attitude towards the Cuban government, are more concerned with the welfare of their Cuban relatives than with Cuban exile politics. They go to Cuba not only to see their relatives but also to bring them money, gifts, and to pay for their stay at tourist hotels in places such as the Varadero beach resorts (where Cubans were not allowed to enter while Fidel Castro was in power). No wonder then that public opinion polls show a majority of Cuban-Americans residing in Florida favor a change in policy leading to full relations with the island. Nevertheless, two-thirds of the Cubans who have arrived since the 1990s are not yet citizens, and affluent, conservative Cubans still have great power over the media and local political system. The three Florida representatives in the US Congress of Cuban origin are right-wing Republicans strongly committed to the blockade. But the winds are clearly in the other direction: Barack Obama won 48 percent of the Cuban vote (and larger proportions among younger Cubans in Florida) in the 2012 elections, a clear indication of the political trend among Cuban-Americans away from the hard Cuban right-wing in South Florida. The change in the social composition and politics of the Cuban migration to the United States has been of great concern to the Cuban hard right for some time. Florida’s three right-wing Cuban-American members in Congress — Ileana Ros-Lehtinen, Mario Díaz-Balart, and Carlos Curbelo — have publicly criticized the hundreds of thousands of Cuban-Americans traveling to Cuba to visit and spend their money with relatives. In 2009, in an interview with a Florida TV station, Díaz-Balart went so far as to compare Cuban-Americans traveling to Cuba with unscrupulous businessmen that made deals with the Nazis during the Holocaust. And when the Cuban government liberalized emigration in 2012 and extended the length of time Cubans were allowed to reside abroad without losing their citizenship rights — thus making it possible for Cubans to obtain US residency while maintaining their rights on the island — Díaz-Balart joined Ros-Lehtinen, the most senior of the three Cuban-American congresspeople from South Florida, in denouncing the Cuban reforms as endangering the Cuban Adjustment Act. It is not surprising that the announcement of the resumption of diplomatic relations between Washington and Havana caused the hard-right Cuban-American voices to demand the abrogation, or at least a substantial amendment to (that is, the gutting of) the CAA with much greater fervor than before, since it was by now quite clear that the CAA was no longer serving its original purposes and was more likely to benefit than harm the Cuban government. But behind the public hostility of the three congresspeople is their longstanding and growing — if unspoken — fear that the CAA itself has led to a growing change in the social and political composition of their constituents, which may in the medium and long run not only undermine their own and their chosen successors’ position as elected officials, but also the hegemony of the hard right in the Cuban-American community. As the newly arrived Cubans become increasingly similar to other Latin American immigrants and the strong hostilities between Cuba and the US diminish somewhat, it is not hard to imagine that as the new Cuban-American immigrants become citizens, they will increasingly vote to protect their socioeconomic interests rather than support the right-wing opposition to the Cuban government. The South Florida representatives have reason to fear the potential loss of their socioeconomic and political base. The Cuban government has also been silent about how CAA-sponsored emigration has functioned as a safety valve for internal discontent over conditions like substantial unemployment rate, worsened by the government’s decision to lay off half a million workers (out of labor force of 5.2 million people) that it began to implement in 2010. Also, by liberalizing emigration rules in 2012, it did so with the benefits of the CAA very much in mind. The Cuban government used the CAA to “have its cake and eat it too” in the sense of making emigration to the US more attractive and resolve at the same time some of the Cuban economy’s problems while still denying its citizens their full and unlimited freedom of movement in and out of the country. Cuba, even after having liberalized its emigration laws, is among the few countries that still limit the citizenship rights of their emigrants. In 2006, the Bush administration extended the CAA’s political logic when it established the Cuban Medical Professional Parole Program (CMPP). This policy allows Cuban medical personnel conscripted to study or work in a third country under the direction of the Cuban government to directly enter the United States from that third country. The number of Cuban medical personnel admitted to the US under the CMPP has significantly grown since the program’s inception. It reached a high point in 2014 when 1,278 people — or 3 percent of the total number working abroad — were granted entry. The Cuban government has frequently denounced this program as an example of the “brain theft” perpetrated by the United States and other economically developed countries, which draw people who are professionally trained at the expense of less developed countries. Undoubtedly, the Cuban government’s policy of sending medical personnel abroad has done a great deal of good, particularly in dramatic cases such as the Ebola epidemic in West Africa. At the same time, however, the export of Cuban medical services has become big business, bringing to the government an estimated $8.2 billion a year. It has been particularly important in Venezuela, where it is exchanged for large shipments of heavily subsidized oil, a vital resource for the Cuban economy. However, if we look closely, it becomes clear that in the last analysis it is the policies of the Cuban government that are primarily responsible for whatever success the US government has had in stimulating the “desertion” of Cuban medical personnel. While many countries require that doctors compensate the state for their free medical education through a social service for a limited time, in Cuba this service is virtually of unlimited duration. It is true that Cuban doctors working abroad, typically under contracts lasting for relatively short periods of time, earn significant additional income. In Venezuela, for example, they get an additional monthly bonus of 3,000 bolívares (or $477.71). But Cuban doctors, like other professionals, are not the “rational actors” of neoliberal fantasy, abstractly trying to maximize the returns on their human capital and willing to move wherever they can achieve those aims. The factors affecting their motivation are far more complex, involving professional autonomy, their expectations of their professional and material improvement in the island, and also their ideals to serve the country. In sum, the key issue is whether they think they have the opportunity to improve their professional and material situation commensurate with their education and training — even if they are not able to reach the metropolitan levels of monetary and professional achievement. If Cuban doctors felt that things were going to get better, fewer of them would want to leave the country. As in other matters, Cuba’s one-party state has attempted, to a substantial degree, to resolve the problems of medical “desertion” and “brain theft” by punitive administrative/police measures such as bans and restrictions. For example, Cuba’s ministry of health recently issued an ultimatum to the Cuban doctors it had sent to Brazil: have their accompanying relatives return by February 1, 2015, or else be suspended from their positions. This course of action was taken despite a new Brazilian law that made it easier for the families of Cuban medical personnel to live in Brazil during their time in the country. Cubans obtain clear benefits from the CAA, and there are also human costs — as in the case of those who have perished trying to cross the Gulf of Mexico. But ultimately, the fate of the CAA rests in the hands of the US government. In the US, the CAA has had strong critics across the political spectrum. In addition to the Cuban hard right, a portion of the US right wants to abolish the CAA as part of a broader project of halting immigration — particularly from Latin America — in order to protect the racial and cultural homogeneity of the US and the electoral majority status of whites. Meanwhile, left critics of the CAA can rightly point out that the original adoption of the CAA was, notwithstanding Washington’s humanitarian protestations, primarily motivated by the imperialist competition between Moscow and Washington — specifically the United States’s efforts to overthrow the Cuban government by force and maintain its imperial hegemony over the Western Hemisphere. However, this issue should not be conflated with the right that Cubans should have to leave the island for whatever reason, including opposition to the government. On numerous occasions, Fidel Castro himself proclaimed that the revolution was a voluntary project and those who didn’t support it were free to go. Yet for most of the forty-seven years Fidel was in power it was very difficult to emigrate, save for relatively short periods when large numbers of Cubans left the island. And, as mentioned above, even the rules liberalizing emigration approved under Raúl Castro do not grant Cubans the unqualified right to emigrate. Less than a century ago, there was virtually unlimited immigration to the United States (with the exception of its Asian exclusion policies). In the late nineteenth and early twentieth centuries, Cuban tobacco workers frequently moved between Havana, Cuba, and Key West and Tampa in Florida, barely a day’s trip by steamboat, in what was in many ways a single labor market. From this perspective, the most powerful argument that could be made against the CAA is that it discriminates in favor of Cubans, to the detriment of other Caribbean and Latin American peoples. The reality is, however, that the immigration privileges that Cubans receive as part of the CAA represent a sui generis kind of favoritism in the sense that they are not part of a zero-sum situation where the benefits that the CAA confers on Cubans could otherwise go to other Caribbean and Latin American immigrants. Moreover, repealing the CAA would do nothing to enhance the prospects of obtaining residency rights or amnesty for any other group of undocumented workers, nor would it increase in any way the number of immigrants allowed in from other countries. In fact, given the newfound hostility of the right-wing Cuban-American members of Congress toward the CAA, it is entirely possible that it will be abrogated, or at least gutted, without Congress moving closer to overall immigration reform. Therefore, we should support the preservation of the CAA. Instead of pressing for the weakening or abolition of the CAA, progressives should instead push for extending its privileges and benefits to other immigrants as a point of departure for a movement that fights for an open-border policy. A good place to start would be Haiti — Cuba’s neighbor, and one of the poorest countries in the Western Hemisphere. Despite such crippling poverty, Haitians attempting to come to the US have not been given the benefits afforded to Cuban emigres. On political, economic, and humanitarian grounds, Haitians — and many others — deserve the same treatment.